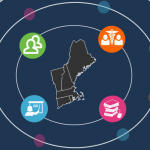 NNLM NER would like to invite you to join us and colleagues from around New England for our annual Regional Advisory Committee (RAC) meeting. We have a wonderful day of learning and sharing planned. This meeting is an opportunity for us to express our appreciation for your support, as well as an opportunity for you to provide your feedback about how we can craft our programming to meet your needs in the coming year. This in-person meeting will take place on Thursday, March 7, 2019 – 9:30am-3:30pm at the University of Massachusetts Medical School in the Faculty Conference Room. We are able to provide reimbursement for your travel and lodging for 1 night (if you are traveling from a distance), your parking will also be validated. We have planned an exciting and informative day. A full schedule is in the works, but some general times are below. We will be sending out more details about the content and logistics to registered individuals as we get closer to the event. Please feel free to pass this along to anyone else who would be interested. We simply ask that every person from an organization register separately at the following registration link https://goo.gl/forms/Rra5DfUSekivtBF33. We are limited to 75 attendees. Please register and let us know if you need to cancel a registration. If you have any questions, please feel free to contact Martha Meacham – martha.meacham2@umassmed.edu OR 508-856-1267.